Mega Sale! Free Shipping Included! 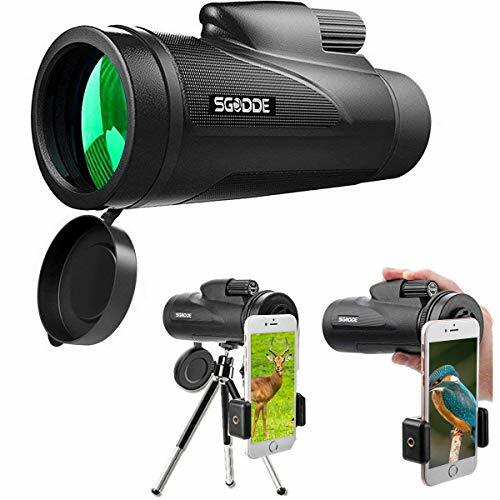 Save 30% on the SGODDE Monocular Telescopes,12X50 High Powered Daul Focus Spotting Scopes-Waterproof,Low Light Night Vision, BAK4 Prism Lens with Smartphone Clip&Tripod for Outdoor Bird Watching Hunting Travelling by SGODDE at C Starr. MPN: SGODDEPevrosd1921. Hurry! Limited time offer. Offer valid only while supplies last. SGODDE 12X50 monoculars telescope,Compact size,HD view and Smartphone adapter,Ideal for Hiking,Climbing,Ball games, Watching Wildlife and Scenery. SGODDE 12X50 monoculars telescope,Compact size,HD view and Smartphone adapter,Ideal for Hiking,Climbing,Ball games, Watching Wildlife and Scenery. Large BAK-4 Prism inside, fully Multi-coated Objective Lens Coating,make your view more brighter,clearer. Comes with smartphone adapter,help you take photos and record videos with your phone.Easy to carry arround. Waterproof, dust-proof, and shockproof design-sealed with O-rings to prevent dust and moisture to get in the device.You can start your outdoor adventures along with this monoculars. Use the center focus wheel to get your target in focus and the micro adjust for adjustment, repeat until you get the best view. 【12x50 High Power Telescope】:Full 12X magnification and 50mm object lens diameter to get great view for you in outdoor adventures.Our SGODDE Monoculars offer optimal field of view (114M/1000M) for Birdwatching,Hiking,Hunting,Climbing, Outdoor sports etc. 【HD View】- All lenses are made from Bak-4 prisms with FMC multi-layer broadband green film, the light transmittance increases up to 99.5% for brighter and higher-contrast images. 【Dual Focusing】- Adopting larger one-hand focus wheel,the telescope can focus easily to get accurate observation and clear images.Adjustable eyepiece can be rotated up and down for optimal viewing with or without glasses . 【Waterproof Fogproof & Slip-on Design】:This birdwatching monoculars with Waterproof ,Shockproof,Fogproof,Dust-proof design.Rubber armor with stripes keep it slipping out from your hands.It's compact shape and light weight make it easier to carry around. 【Upgrade Accessories】 : Extendable stable tripod and cell phone clip that help you to get a HD image or video easily.Upgrade phone clip is compatible with iphone, Samsung, LG , Huawei and almost all other smartphones,it even can use for other telescope and monoculars.